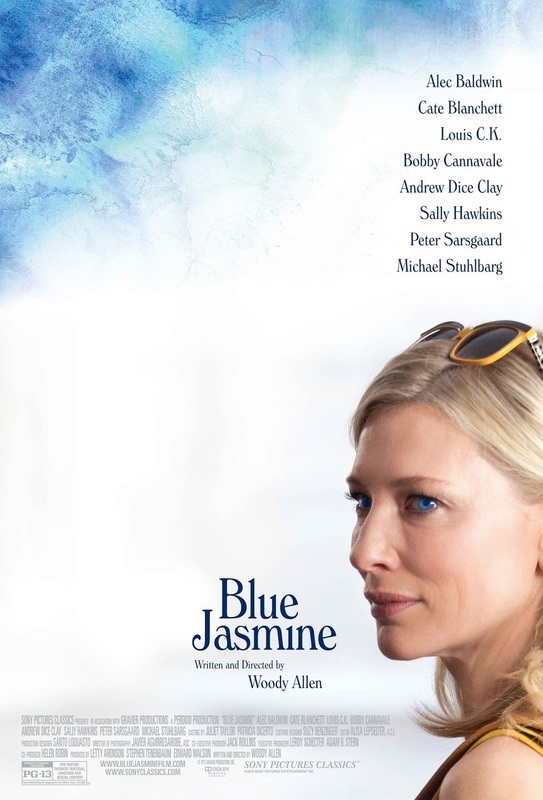 Upon its release Blue Jasmine received rave reviews from viewers and, after a few months hovering around cinema screens and iffy online streams, is variably considered a return to form from the eccentric Woody Allen. I’m not extensively versed in Allen-lore, not nearly as much as i ought to be considering his lofty status in Hollywood and abroad. That being said, whilst his newest offering brims with scintillating performances (two Oscar nominated deliveries stand out in particular) the content, narrative and direction all add up to something a bit… bland. It’s a difficult story to consume and a tricky one tell, a story that shouldn’t insist on generating humour as often as it tries, particularly when there’s non to be shared. It’s possible that I just don’t get it; that the quirky, erudite versus blue-collar joust is something not entirely compatible with this 20-year-old. More than that though, Allen seems to be trying overly hard as he attempts to deliver on one too many fronts, leaving the intended humour absent and the compulsory drama simmering. But only just simmering. Jasmine (that’s Jasmine, not Jeannette) Francis is an upper-class socialite from New York who finds herself mentally, physically and financially drained following separation from her unashamed husband, Hal (Alec Baldwin). She isn’t used to earning, to maintaining herself and her life outwith superficial externals such as high-brow struts and an aristocratic ambience. Only it’s not an ambience, it’s an annoyance. An annoyance that has haunted her sister Ginger (Sally Hawkins) ever since childhood, when their foster parents favoured Jasmine’s superior “genes”. In her time of need, Jasmine (Cate Blanchett) moves to San Francisco to live and survive by Ginger who remains frustrated over a misshaped business deal proposed by Hal, amongst a number of other issues related to her now spiralling sister. Evidently there’s a lot going on, yet too often the happenings are overly trivial — discussions reigned in on antiques for example — and therefore aren’t substantial enough to fully engage the viewer. Perhaps that’s the point, that Jasmine is such a one-dimensional and flawed character, therefore the film should be too. This approach doesn’t catch on though as Jasmine and many of the other people on screen are very difficult to relate to. At one point Ginger points out the obvious: “When Jasmine don’t wanna know something, she gotta habit of looking the other way.” In a sense the narrative follows this mantra too — just when there’s a glimmer of something intriguing on the horizon the road suddenly detours back to stagnant repetitiveness. And it certainly is repetitive. As their lives together progress and various agents enter and exit (boyfriends mainly), Jasmine constantly scalds Ginger for her poor taste in unworthy men. First it’s Augie, a working-class and slightly optimistic guy held down by the harsh realities of life. Chili follows, a mechanic who unlike Augie treats Ginger with respect even if at times his exuberance gets the better of him. Jasmine relentlessly disapproves, neglecting her own prior misdemeanours when it comes to settling with the right partner. In fact, her wrongful rejection of Chili is probably the only time Jasmine is not thinking about herself: she often reminisces about sailing around San Tropez in front of her less fortunate sister who has hardly travelled America never mind the world; she flies first class on her way to Ginger, even though she has no money, which is the main reason for her relocation; in fact Jasmine removes herself from all tasks unbecoming of her (“I never pay attention to house business affairs”). Combined, this makes it incredibly difficult for the viewer to like or even sympathise with Jasmine, which is essentially the downfall of the film as the camera stalks her every move and not much else. Allen juxtaposes the past and present as life events interchange; from detailing the breakdown of Jasmine and Hal’s marriage to the breakdown of Jasmine herself. Occasionally happenings on screen are tough to watch, but it is often the case that these demanding moments are followed by attempts at humour thrown in as the embodiment of a panicky life-jacket, almost as if the film is fearful of advancing that extra step into Jasmine’s oblivion (which would’ve worked better than the half black comedy, half drama on show). For example, after a tortuous altercation pitting Ginger and Jasmine against an enraged Chili, Jasmine is seen quickly shaking off any resultant cobwebs as she searches for her ringing phone in a nonchalant manner. This woman has recently lost the love of her life in onerous circumstances — wouldn’t she be affected more by this attack with potentially mirroring connotations on her sister? There is success emitted from Allen’s alternating timeline approach though, as the method distinctly displays the degree of culture clash between Jasmine and Ginger. Jasmine has had everything handed to her on a silver platter. Now that life has crumbled, her anxiety over what’s next conveys exactly how behind she is in the experience of every day normality: she wants to return to school (to study what? ); will study fashion or interior design (can’t use a computer); takes computer classes (has no money to afford); accepts the “medial” job that she never wanted, the job that the vast majority of those around her do on a daily basis. As average as the film is, there’s absolutely no denying the power and sheer struggle evoked by Cate Blanchett as Jasmine. It’s not even a case of the film’s downfalls making her performance glow even brighter, no, Blanchett’s display would stand out in any offering. Even though you don’t really like the character, it’s impossible not to be drawn in by Blanchett’s depiction of painful demise as Jasmine slowly loses all sense of wherewithal and dignity. The portrayal is uncomfortable to watch at times and it should be that way. Without Blanchett at the helm, the film might have teetered worryingly close to Diana territory. Sally Hawkins also deserves plaudits for her starkly contrasting role as the less fortuitous sister; likeable and empathetic as she establishes and maintains a strong sense of empowerment throughout the film’s progression. In an abnormal role from his usual work, Peter Sarsgaard is astute and pompously slick as the yin to Jasmine’s yang. Their first meeting is actually one of the film’s better moments, where the pair enter a self-congratulatory word-off as they divulge many an “I” and “my husband and myself”. It’s arrogant and self-absorbed nonsense, and it completely works because these characters come across as utterly undesirable just as they are supposed to in that moment. 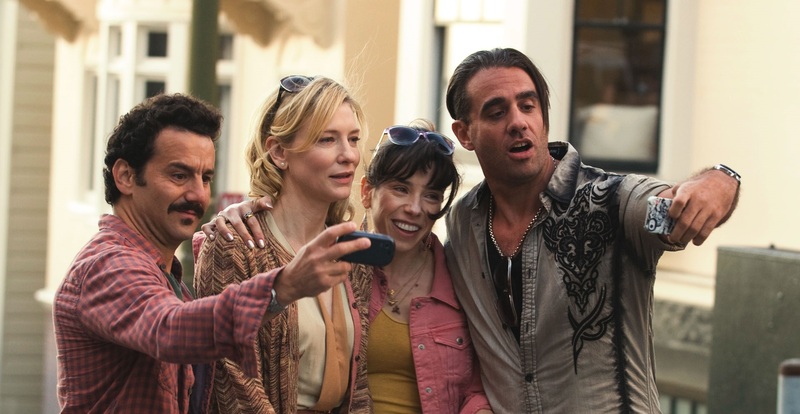 Blue Jasmine is a film where nobody really seems to be listening to each other (“Pay attention Augie”), where characters are solely focused on getting their two — or 20 — cents in, meaning proceedings feel too feeble. The darkly comic moments don’t really fit in, and the emotionally wrought sections seldom have the desired effect. It’s no surprise that that actors are receiving awards nominations left right and centre as opposed to the film itself. While it is far from terrible, there’s a lot of onus on Cate Blanchett to make the picture worthwhile. Thankfully, in doing her worst, she does her absolute best. One of those rare instances in which Woody allows his ensemble to do most of the talking for his script, and it’s an absolute blast to watch. Good review. It really was exceptionally well acted. Personally, just needed more from the film itself. Thanks Dan!